Many developers are not happy with working for other companies. They do not have much autonomy to work on projects they want, they cannot work from home, they cannot work any time they want, and in the end they get paid a limited amount of money. The alternative for these unhappy developers is to create their own software products and sell them to many customers. Unfortunately many developers do not know how to get started and become successful. The good news is that this is the first of series of short videos that will teach developers all they need to know to create their own businesses developing products that the customers really want and will pay for. Watch this short video to learn about why creating your own products is the right step to be a happier developer, as well how you can attend a free online workshop that will teach the essential steps to achieve that goal. 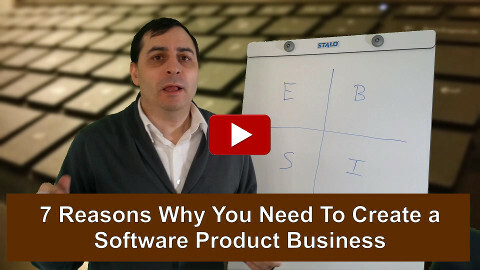 In the video below you will learn about why you can evolve your career of developer by working in your own company developing your own software products and selling to many customers, instead of working for others for a limited amount of money. You can also learn about a free workshop that will be announced soon, so you can learn the essential matters regarding establishing as a successful software business company. Make sure you signup to be notified when the workshop is launched, as well when new follow-up videos are published.